Audi, India’s third luxury car maker by sales, replaces its best-selling sports utility vehicle or SUV Q5, but does the more sophisticated all-new second generation Q5 make it a more compelling option than the Mercedes-Benz GLC, Land Rover Discovery Sport, BMW X3 as well as the newly launched Volvo XC60 in India? If the Audi Q7 is too big, which it is, and the Audi Q3 a bit too small, then the German brand has brought in the Q5 in diesel to choose for now. Petrol version will follow later. The Ingolstadt-based automaker will replace the extremely popular first generation Audi Q5, which was launched in India in 2011 with a sticker price of about Rs 48.44 lakh. 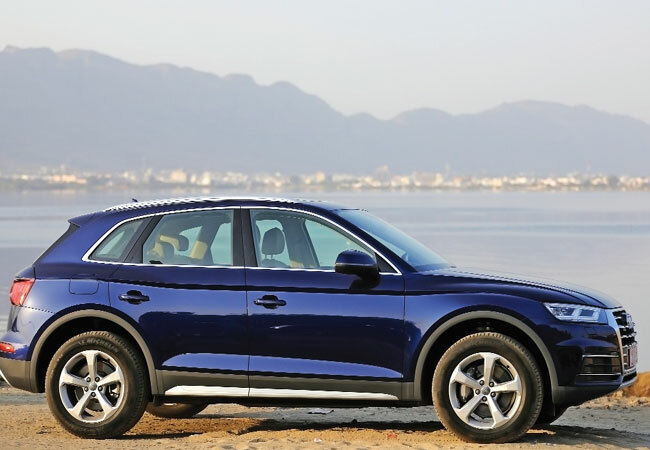 The second generation Q5, which will be introduced on January 18 is expected to be priced a tag higher at around Rs 50-55 lakh. This will be the first launch of the company and the car will be assembled at the Volkswagen factory in Aurangabad in Maharashtra. This model has been quite a success story for Audi, with every third Quattro-equipped car sold being a Q5. So a lot work has gone in to perfectly fill in its predecessor’s rather large shoes. The all new Q5 is based on the MLB EVO platform, the same one that the Q7 is based on. This has allowed the engineers to make it longer, wider and taller than the previous one. It also weighs 65 kilos lighter, which is good news for fuel economy and performance as the power is increased by 8 per cent and fuel efficiency by 20 per cent. It is attractively more athletic and, visually, a little more compact. That Q7-like grille and headlamp combination are more raked back and angular and the daytime running lamp signature is quite different. In profile, the Q5 continues to look familiar with the roofline sloping into a gentle curve at the rear. The wheel arches are more flared now and there is a sharper crease along the shoulder line, but they are not the most apparent. However, the tail-lamps are more easily distinguished. The 18-inch alloy wheels look a bit too ordinary and the company should have opted for a more dramatic-looking set of wheels. On the inside, the cabin is in line with contemporary Audis. There is the redesigned steering wheel along with, what is now common, a virtual cockpit. The massive screen that makes up the instrument cluster now offers an uncluttered view of essential information at a glance. You could set it to vehicle information, the playlist you are listening to, the phone you have paired it with or the route you are navigating. The 8.3-inch screen sits as a part of the central console. Other features include a touchpad that recognises handwriting, MMI controls and a phone box to wirelessly charge your device. Also, the longer wheelbase has freed up more space for the passengers with good legroom in the rear bench too. The boot has more than enough space to park the luggage of a family out on a longer outing. I drove the Q5 from Ajmer to Pushkar in Rajasthan. Undoubtedly, it was a smooth and comfortable drive as the Quattro all-wheel drive allows it to put power down really effectively and rather quickly. It also delivered a nice kick as you race along the highway. I drove the new SUV through a few towns, villages and even off-road sections to take photographs and the Q5 felt perfectly comfortable in all the situations. The Q5 is five cars in one as it offers Comfort drive mode, Dynamic mode, Auto mode, Individual mode and Off-Road drive mode. In Comfort mode, it offers an unruffled ride on less perfect roads as it offers optimised steering and clear shift patterns for a relaxed drive experience. But in Auto mode, the car automatically adjusts settings for seamless combination of comfort and responsiveness. Of course, there was not much time for longer Off-Road drive experience really but on the other hand, in India most would not buy a Q5 for that anyway. With a top speed of 218 km, Audi claims that the Q5, with its 2.0-litre TDI engine with 190 horsepower clocks 0-100 kph in flat 7.9 seconds and the way the power is delivered there is no way to dispute that. Also, the smooth 7-speed DSG and the Q5 feels almost effortless. In fact, Audis are generally light to steer, but the Q5 feels especially so with only a marginal difference in feel registering once you select dynamic drive mode. This is a tough question to answer, really. Its archrivals the Mercedes GLC and the Volvo XC60 are undoubtedly attractive too. Also, Land Rover has two distinct flavours in the Discovery Sport and Evoque. Although, the all new Q5 has a lot to offer cabin, space and engine wise and the overall great design, pricing will sway the buyers in the country.